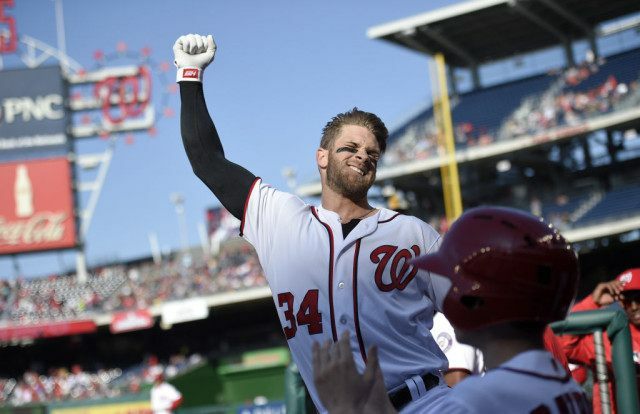 WASHINGTON (AP) — Bryce Harper hit his first grand slam to reach 100 career home runs, launching a shot that smashed a panel on an electronic signboard and sent the Washington Nationals over Atlanta 6-2 Thursday, dropping the Braves to 0-9. The Braves and Minnesota, which fell to 0-9 hours earlier, are the first major league teams to lose nine in a row to start a season since Detroit in 2003, STATS said. Atlanta moved closer to the team-worst 0-10 beginning in 1988. Harper connected for his slam in the third inning and became the eighth-youngest player to hit 100 homers. The reigning NL MVP is 23 years and 181 days old — Hall of Famer Mel Ott was more than a full year younger when he became the youngest to do it. Stephen Strasburg (2-0) allowed two runs over 7 2/3 innings, a day after he was scratched due to illness. Wilson Ramos had a solo home run and an RBI double as Washington improved to 7-1, tying the 1974 Montreal Expos for the best eight-game start in franchise history. Julio Teheran (0-2) gave up six runs in seven innings. Nick Markakis singled, doubled and drove in both of Atlanta’s runs. Braves manager Fredi Gonzalez opted to rest slumping slugger Freddie Freeman. Teheran had a 1-0 lead after Markakis’ RBI single before loading the bases in the third on a walk and two singles. Up came Harper, who hit Teheran’s fastball off the signboard at the base of the second deck in right center. The impact of the blast, Harper’s third home run of the season, left a small panel dark for the remainder of the game. Those runs were more than enough for Strasburg, who looked strong despite any illness. He struck out seven, allowed four hits and walked two over 100 pitches, and left to a hearty ovation from an announced crowd of 21,144 after fanning his final batter, Mallex Smith. Nationals: Manager Dusty Baker suggested Strasburg’s condition had improved on Thursday, but that the right-hander still wasn’t at 100 percent. Braves: RHP Williams Perez (0-0) will start Friday’s series opener against the Marlins looking to improve upon his first start. He allowed four runs in 4 2/3 innings in Sunday’s 12-7 loss to St. Louis. Nationals: RHP Joe Ross (1-0) faces Philadelphia for the first time in his career as Washington begins its second road series of the year.